According to the official twitter account of the Heidelberg Laureate Forum, Sir Michael Atiyah will prove the Riemann Hypothesis during the talk on Monday Sept. 25. According to him, it is a “simple” proof, based on previous work by von Neumann, Hirzebruch and Dirac. It is likely to have some relation to theoretical physics, since Dirac is a theoretical physicist. It has been rumored for quite some time that the Riemann Hypothesis is related to theoretical physics. The Riemann Hypothesis is the most famous and most difficult problem in mathematics. Sir Michael Atiyah is a 89 year old gentleman currently. It will be really groundbreaking if the Riemann Hypothesis is found to be successfully proved. 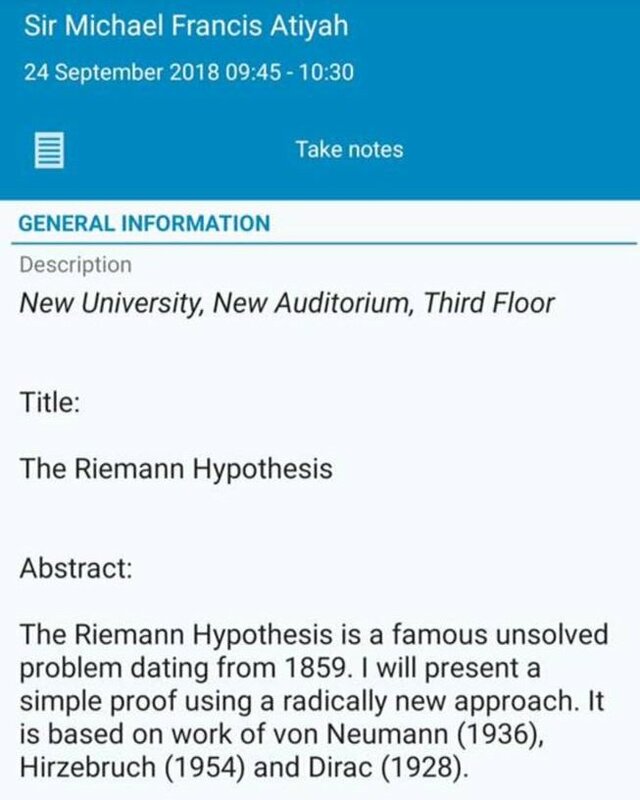 This entry was posted in maths tuition and tagged Math, Riemann Hypothesis. Bookmark the permalink.